Smart Contract development company write Blockchain programs as per your business needs. Smart contract define terms and conditions digitally on Blockchain between two parties. Public Blockchain Ethereum is most popular for smart contracts. Though, the public Blockchain like Bitcoin also can be used for smart contract. Before the concept of smart contracts business people were making paper based contracts in which all the terms and conditions kept mentioned. This manual process requires lot of human energy and is with full of hassles. Smart Contract are automated and whenever a condition gets fulfilled an action get triggered. 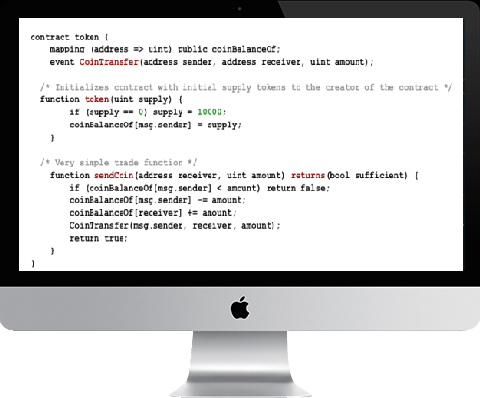 Our smart contract developers use Solidity programming. ERC20 algorithm is used on Ethereum blockchain. Smart contract developed on Blockchain are highly secured and no one can manipulate any data already entered. By this, either party can’t breach the contract already made. Smart contract can be applied in any industry, only feasibility in terms of cost of the project needs to be studied. Besides smart contract our Blockchain developers are providing Cryptocurrency token development, Cryptocurrency coin development, ICO development, ICO marketing, Cryptocurrency exchange development services and so on. In short, we provide complete Blockchain technology solution. Our smart contract developers use Ethereum public blockchain and use Solidity programming. Our smart contract developers can build contracts in your private blockchain network too. It is immaterial for our smart contract developers that for which industry the digital contract is going to be developed. Experienced Blockchain Developers – Our developers have already experience of providing smart contracts solution. Strong Portfolio – Our blockchain developers have developed successful smart contract projects leading satisfactory business cycle. One Stop Solution – We not only provide the programming solution but the whole business solution for blockchain technology. Quality to Price Ratio – Our quality to price ratio is always at higher side, par your imagination. Seamless Communication – Communication is the key to attain the mutual goal. We value it well. Support & Maintenance – We provide continuous support and maintenance services for the blockchain technology projects.